Good condition. Some minor box damage. Some zombies have broken limbs but doesn't really gameplay or the look (due to how you use them). 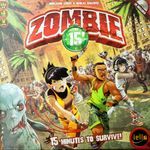 Also includes Zombie 15': Left Alone – Solo Campaign and some promo cards.